The announcement of Dmitriy Medvedev regarding the coming renewal of serial construction of nuclear powered submarines for the Russian Navy had a broad resonance in the society. Being in the critical state the Russian fleet requires prompt replacement of warships and the interest taken in by country’s leader offers hope for rapid change of the situation. Since long ago the submarines have a dominant role in the Russian Navy. From the late fifties of the last century when after death of Joseph Stalin the new Soviet government placed the main stake on establishment of missile nuclear submarine force and till today the underwater fleet forms the core of the combat strength of the Navy. Severe reduction of the Navy in numbers combined with construction freezing of new crafts (construction of only those submarines with high level of readiness was finished) led to the situation when due to equipment wear and tear the submarine fleet in on the edge of dramatic cut in numbers. Construction of new submarines resumed only recently unfortunately it is not covering the pace of retirement of overage units. A special stress in Medvedev's announcement was made on construction of cruise missile submarines (SSGN) and attack submarines (SSN). These classes of submarines had been subjected to especially severe reduction in previous years. Should the serial construction of nuclear powered submarines of project 955 have been started already then the situation with SSGN's and SSN's seems to be more critical. 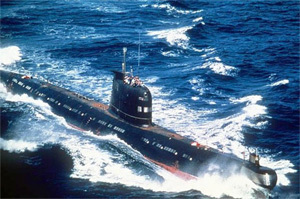 Yet in the nineties the construction of SSBN of project 885 was started (the type ship was named Severodvinsk) later according to various sources there were laid from one to three hulls of this type however not even the type submarine was commissioned for the Navy. There are several arguments produced among which the one can find the statements of improper design that required amendments introduction already at the stage of construction. One way or another but not a single submarine of this project is commissioned and the core of anti aircraft carrier forces is still formed by 8 submarines of project 949A built in the eighties and nineties of the last century. These superb submarines with high military characteristics are loved by their crews but even they advance in years gradually. The situation with attack submarines is even worse. The building slips have no new “underwater destroyers" that are designed mainly to be an antisubmarine and antisurface warfare and to deliver strategic cruise missile strikes upon shore targets. At the moment the Navy has 19 submarines of this class in-commission of three different projects: 671RTKM (four units), 945 (945A) (three units) and 971 (twelve units). The majority of these submarines were built in late eighties and middle nineties. Now they still can be considered as up-to-date but their ageing is not far off. It is known fact that a number of shipbuilding design bureaus are developing the designs of new attack submarines but details regarding keels laying dates and military characteristics are not of public domain yet. What are the needs of Russian underwater fleet in new cruise missile and attack submarines? There are several speculations in this respect but the greater part of assumptions trend to 30-40 non-strategic nuclear powered submarines as the most optimal number. Taking into account the fact that in 15 years at least half of 27 submarines of the named classes in commission at the moment will be decommissioned as worn out then for the purposes of maintaining the current number the industry shall deliver at least 20 non-strategic nuclear powered submarines. In theory such output rate is not something extraordinary as there are several plants in Russia capable to build nuclear powered submarines namely Sevmash, Admiralty Yards, Komsomolskiy Zavod and even Krasnoe Sormovo have similar experience. Yet there are a number of problems with regard to allied suppliers and above all human resources that decreased dramatically including personnel’s level of training. It remains to hope the solution of these problems will soon be found.